Single mum Alice Lake finds a man on the beach outside her house. He has no name, no jacket, no idea what he is doing there. Against her better judgement she invites him in to her home. Twenty-one-year-old Lily Monrose has only been married for three weeks. When her new husband fails to come home from work one night she is left stranded in a new country where she knows no one. Then the police tell her that her husband never existed. 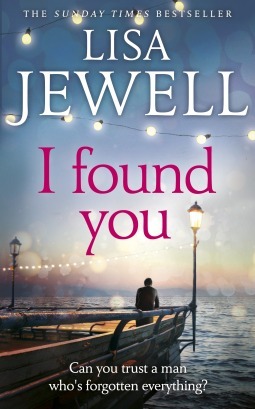 In I Found You Lisa Jewell has written an interesting story of a number of people. While at the beginning their lives are distinct, various turns of events mean that they all converge. Alice is the kind, compassionate somewhat on the fringe woman who takes Frank in when she finds him just sitting on the beach with no idea of who he is and where he came from. He doesn't know his name - it is Alice's younger daughter who names him Frank. Lily is a young woman from the Ukraine, very much in love with her husband and waiting for him to come home but one evening he doesn't. It soon turns out there may be a lot she doesn't know about the man she married. I liked her, her persistence and resilience in the face of shock and disbelief. We are also taken back to a family on a seaside holiday in 1993, parents and two children Kirsty and Grey. While there they meet a young man who takes a shine to Kirsty but when she starts to turn from him because she doesn't find she likes him things turn somewhat sour and then dark. As the story switches from each time and viewpoint, steadily the facts are built up. The links are surmised and then ratified. It is a mystery, but one the reader can unravel along with characters in the story. In places it is dark and twisted but very well balanced by the down to earth, likeable people that help out Lily and Frank to find out the whole story. And in the finding of and facing the whole story there is a chance for a new and wholesome life. Oh wow Kathryn, this sounds amazing unfortunately I'll have to wait until April of 17 for it to make it across the pond. LOL Thanks for the great review! I'm definitely going to have to check this one out. I'm reading Lisa Jewell's new book at the moment and I know I'm going to want to catch up on her backlist once I'm done. I ordered this book, which is (hopefully) wending its way toward me, as we speak. There was no e-book availability, or I would have it already. Thanks for sharing...I love the sound of it, just as I thoroughly enjoy this author. I wasn't aware of this book by Lisa Jewell. I hope you are enjoying your Saturday/Sunday. I enjoyed The House We Grew Up In by Lisa Jewell. That book went beneath the surface. It sounds like this one does too. I found you sounds very interesting. Great review Kathryn. Oh... am intrigued by this one. It sounds like there's lots happening!